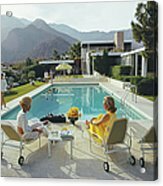 Poolside Gossip by Slim Aarons - 12.000" x 8.125"
Poolside Gossip framed print by Slim Aarons. Bring your print to life with hundreds of different frame and mat combinations. Our framed prints are assembled, packaged, and shipped by our expert framing staff and delivered "ready to hang" with pre-attached hanging wire, mounting hooks, and nails. There are no comments for Poolside Gossip. Click here to post the first comment. Premium Rates Apply. 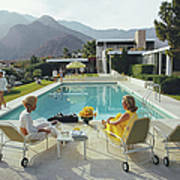 A desert house in Palm Springs designed by Richard Neutra for Edgar J. Kaufmann. Lita Baron (far left) approaches Helen Dzo Dzo (left) and Nelda Linsk, wife of art dealer Joseph Linsk. 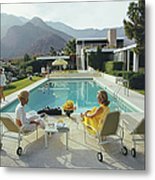 Original Artwork: A Wonderful Time - Slim Aarons (Photo by Slim Aarons/Getty Images)Image provided by Getty Images.